With today’s DJs achieving fame and celebrity status like the artists whose albums they spin, no one is at a higher level than Philly’s own DJ Aktive. 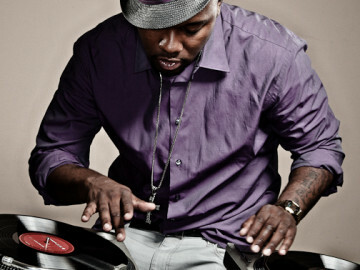 Spinning professionally for the past 18 years, DJ Aktive has made serious moves in his career that have taken him literally around the world with some of hip-hop and R&B’s biggest names, including Janet Jackson, Kanye West, Miley Cyrus, Nas, Common, Jennifer Hudson, Estelle, John Legend, Marsha Ambrosius, The Roots, LL Cool J, Tyga and Queen Latifah, to name a few. A master turntablist and “must-have” DJ of choice when it comes to big-name tours, VIP celebrity events, radio shows and TV appearances, DJ Aktive knows instinctively the power music has to make or break any event. Whether spinning at a backyard BBQ for family or a stadium packed with thousands of fans, DJ Aktive uses his uncanny ability to immediately tune into what people want to hear and create a party atmosphere. By honing his skills, blending, beat juggling and mixing songs, DJ Aktive has captured the attention of fans worldwide with his unique brand of popular, highly entertaining shows. It’s also what has earned him a reputation as the hardest working DJ in the biz with an impressive track record to back it up! Featured DJ: Teen People Magazine; Sega/NBA All-Star Weekend; Puff Daddy, L.A. Reid and Jay-Z’s holiday parties; Reebok Store Grand Opening; NYC Apple Store/Soho, Julius Erving Summer League Basketball, VH1 Music Choice Channel, Morgan Stanley Grammy Awards Viewing Party/Hard Rock Café-Philly, etc. Host: Sirius/XM Radio’s “360 Mix Show” on Ch. 67 The City, G Unit Radio Show and Shade 45.